The day’s means of transport will be the humble rental bicycle, the memories of being stranded at the back end of Bagan with a flat tire some 20 years ago still lingering painfully. The bicycles from the View Point hotel seem fair enough, the seats at the proper height, the wheels spinning freely, the brakes functional, and the tires fully inflated, although nothing is preventing flats from manifesting in the remotest corner of the archaeological site. The initial travail of using these bikes appears as I slip and slide, traction and balance difficult in the loose sand on the street. I had wanted to stop off in the cafe that I had seen at the side of the street in the town, but at first they tell me the place is entirely reserved as they busily arrange the chairs and tables. The place looks a bit stuffy in a faux old world sense – but 2,500 kyat for an espresso? Forget it! Ambling further into town, another smaller local restaurant appears with the usual panoply of different foods, but catering to a local clientele, with reasonably priced coffee. 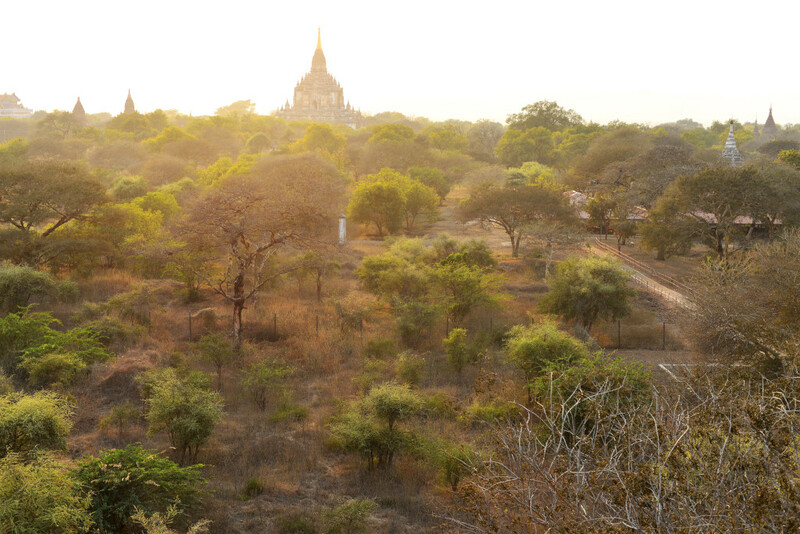 The road meanders out of the village westward past increasingly luxurious hotels flogging the Bagan mystique with various degrees of success, fronted by modest roadside stands, the initial stupas appearing amidst the arid scrub around us. 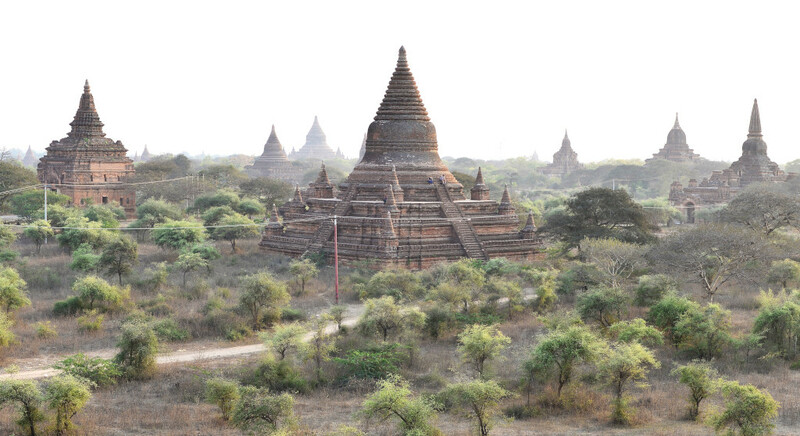 There seems to be little sense of order to the manner in which the stupas are situated, but in the time this area was used by the Burmese royalty, it would seem that the relationship between the areas would have been better delineated. Furthermore, the size and scope of a structure would have been dictated by the sponsor’s position in the court. I can also imagine that gardens would have been maintained around the temples when they were commissioned. The heat is intense and already I am feeling the effects, feeling utterly depleted of energy. 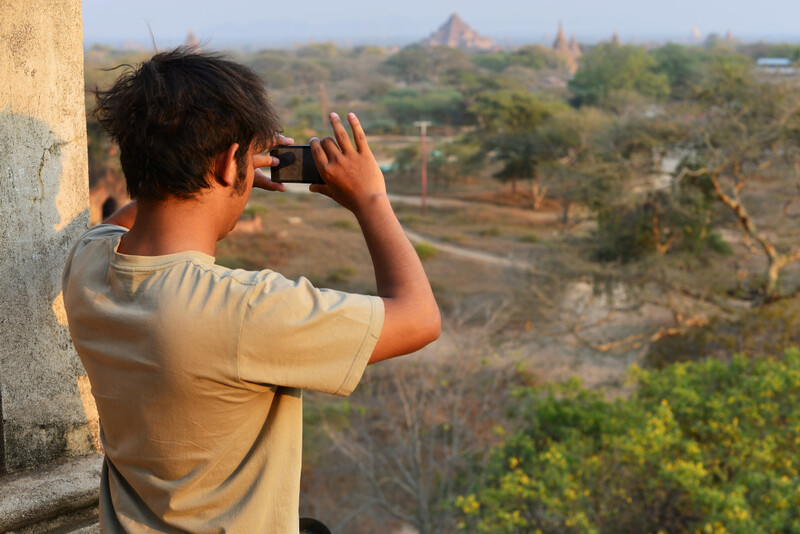 In fact, trying to find the appropriate part of Bagan to explore when all you see is an ocean of almost identical temples seems like a particularly daunting exercise. 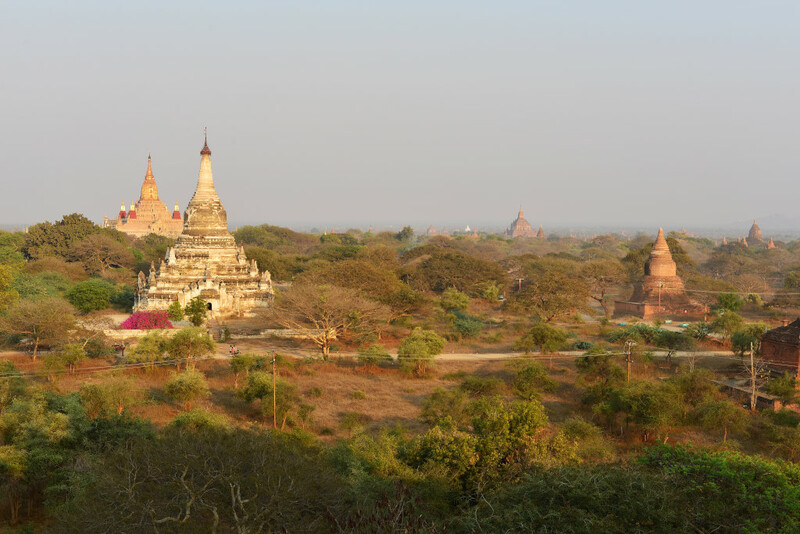 The first set of stupas looks enticing, simply in virtue of being the first. 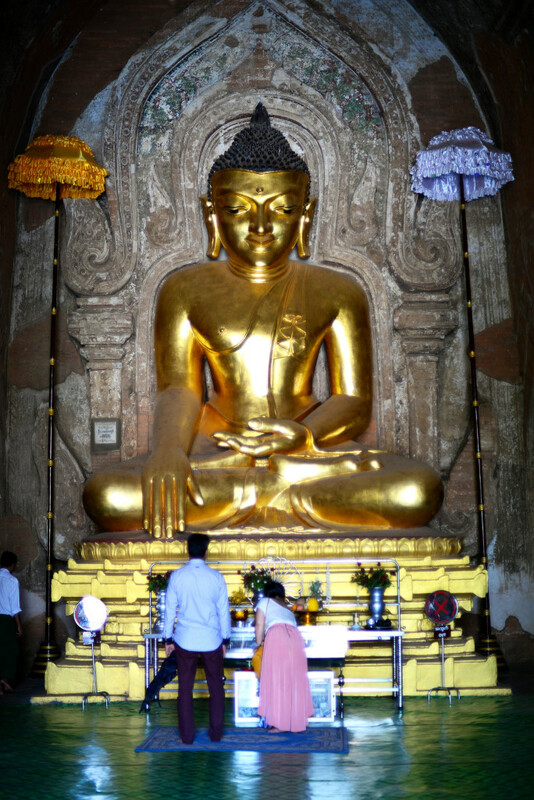 Inside, the central altar features a relatively newly repainted statue of seated Buddha, assuming the mudra of one palm pointing upwards and the other hand palm down, pointing to the ground. 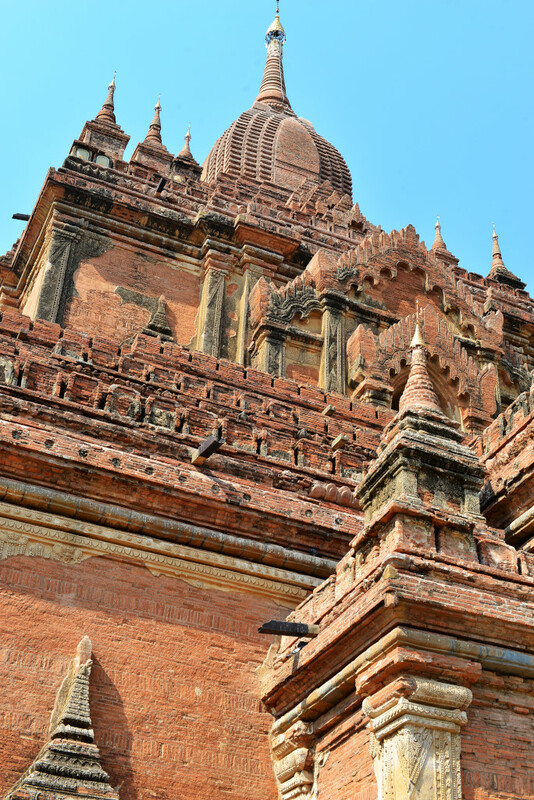 The exterior of the structure seems relatively symmetrical, dictating the general look of the temples large and small across the extensive terrain of Bagan. 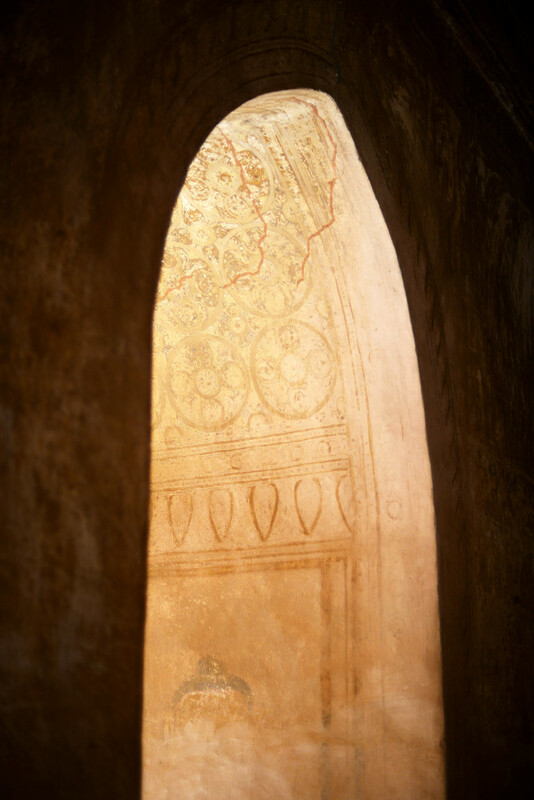 Staggered fluted arches crest the portals located at the cardinal points of the stupa. The roof of the first level is surrounded by simple crenellation, the entire structure culminating with a four-side flattened onion dome peaking in a rounded top. 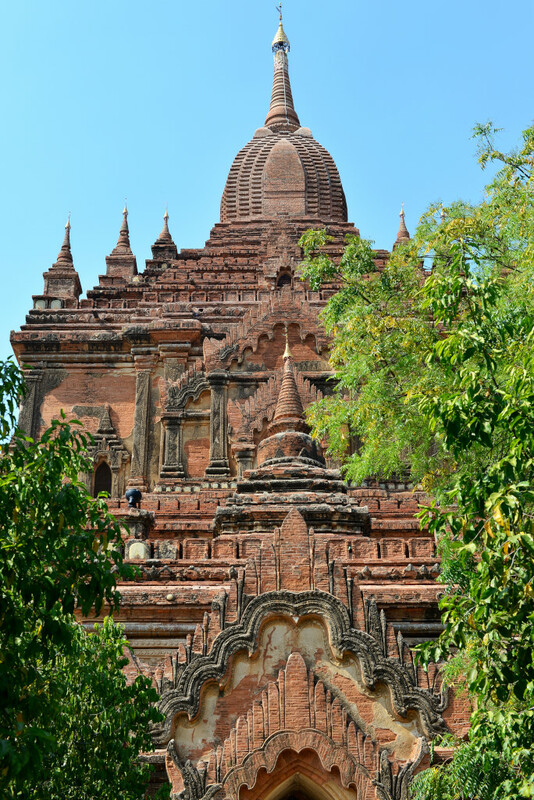 The temple takes the typical Bagan form of an embellished square, with stone porticos providing the principal access to the interior chapel containing the Buddha. 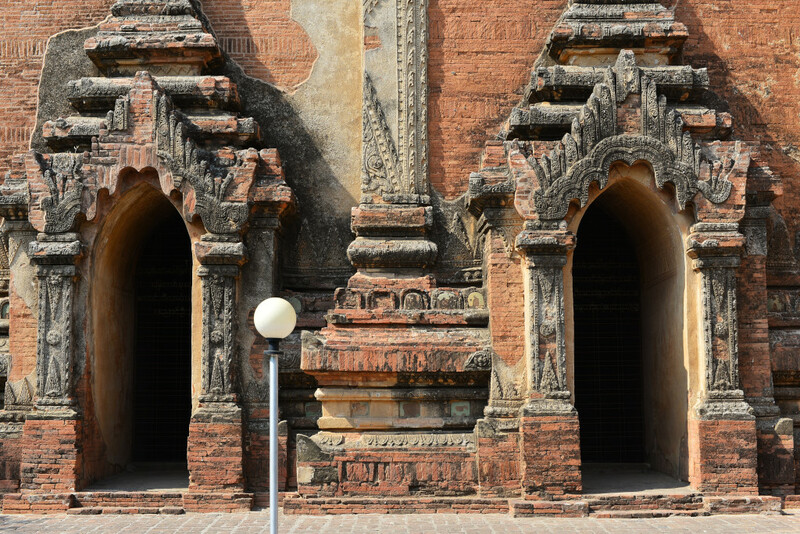 Unlike contemporary Buddhist temples in which there are no side passages radiating from the central Buddha altar, the stupas at Bagan feature passages that circumambulate a central column, the outside face of each column housing an identical and often gigantic figure of Buddha, facing towards the cardinally-position entrance. In some cases, the central passage from the front is open, but the side entrances have been bricked shut. A tiny staircase inside the structure leads to an upper terrace, but I can see that it will not be pleasant for me to climb, given how confined it is. I am content to walk around the thorny bushes and take some hopefully properly framed photos. Locals loll around inside with the intent of selling their sand paintings, the stylized paintings of ancient-era subjects compelling, but the representational paintings look gaudy. The remnants of low walls surround this as many other temples. In some cases, smaller and rounded stupas are in evidence, although they are few and far between. 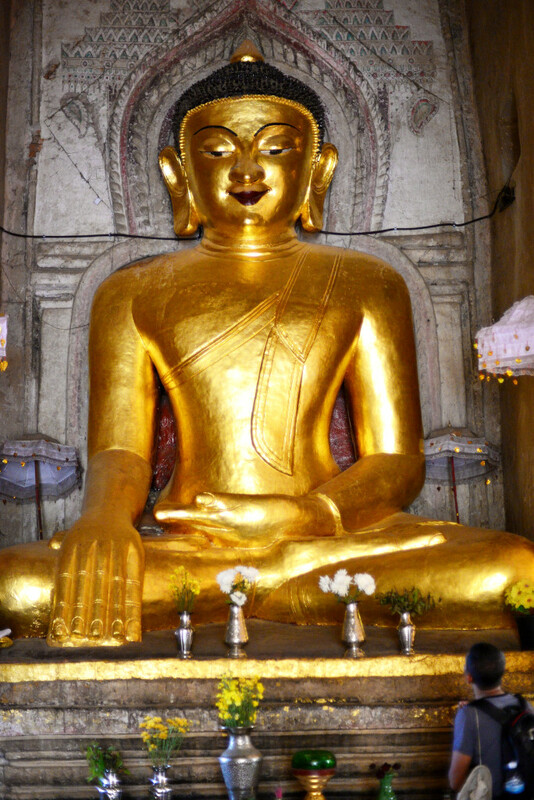 The Htilominlo Guphaya follows the same essential architectural precepts, except on a far larger scale. 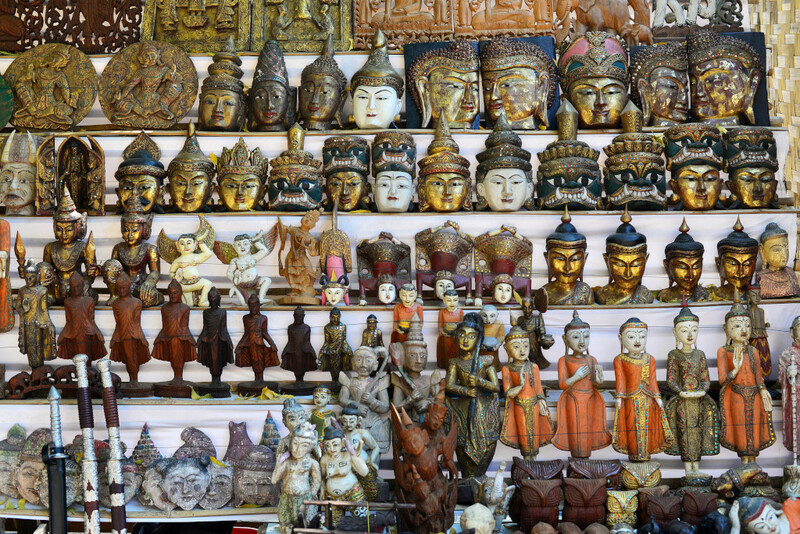 The interior courtyard is lined with vendors selling every manner of art and craft, including jewellery, bracelets, pendants, lacquer, puppets, carved wooden panelling, masks, and varied representations of Buddha. I am compelled to buy some things but then change my mind, as I will have to carry the stuff through the remainder of my trip, and yet the reality is that the crafts here are probably as good and inexpensive as would be found anywhere else in Asia. 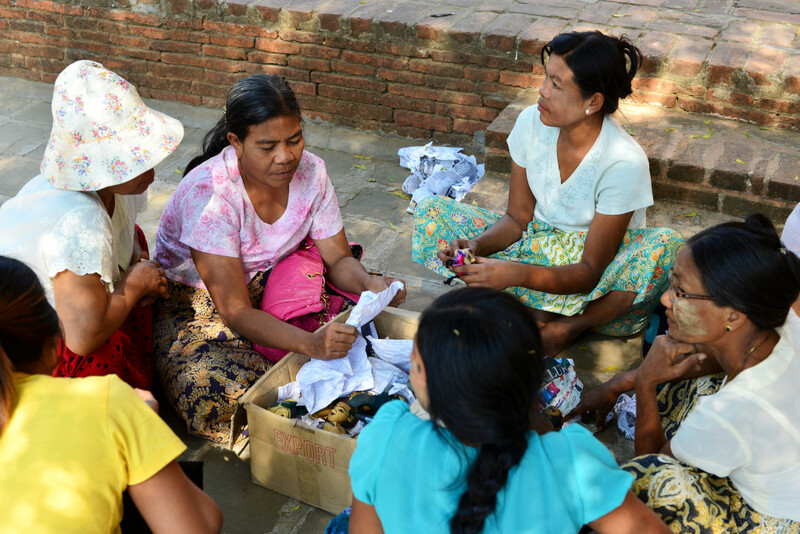 One booth of cheap jewellery has brought in a star attraction, two older Kayin women with ringed necks, although they are largely relegated to a circus side show. Hordes of people ring the women and take pictures, although participating in the freak show seems a bit nauseating. Weaving amongst the sandy alleys that lead towards the river, a village setting emerges, villagers going about their somnolent duties on foot and by bicycle, the exhausted trees leaning over the crumbling walls and dusty shacks. 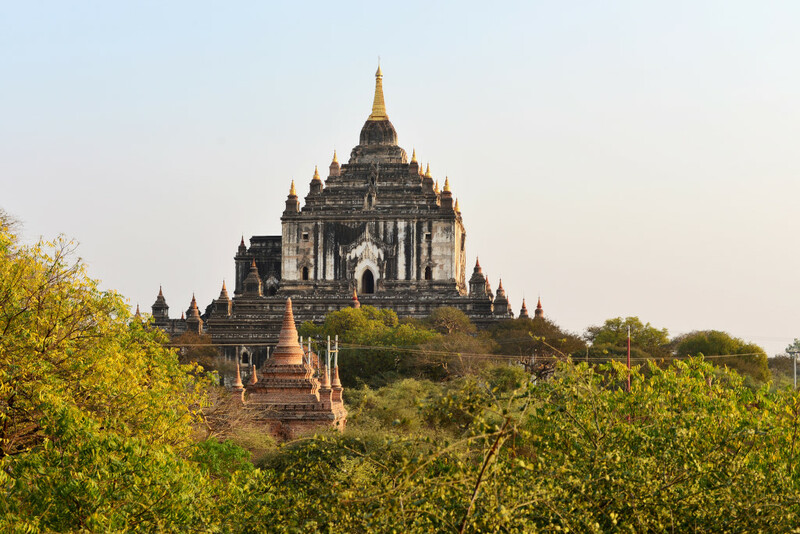 A small and relatively contemporary temple appears on a cliff overlooking the water, a number of riverboats docked alongside each other below, the Irrawaddy wide and still in the searing afternoon heat. Some young locals lounge on the brink of the precipice, indifferent to my presence, one intently staring at his cell phone, and the other peering into a book on the socioeconomic characteristics of cooperatives. 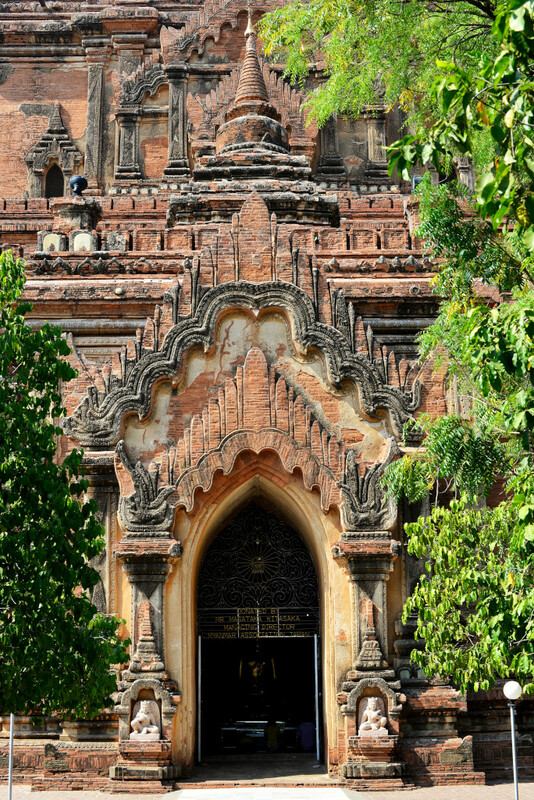 One of the principal destinations in Bagan is the Ananda temple, with its elegant terraced passage skyward, crowned by a tall and squat golden spire, not to forget its size and elevated terraces, which offer sublime sunset viewing opportunities of the countryside’s surrounding antediluvian spires. The general shape and look of the temple is visible at some distance, but closer to the structure, the visitor is easily subsumed into the long passages that radiate from the sides of the complex. Covered passages shelter vendors of crafts, snacks and of course devotional offerings. The vendors loll around their shops, probably selling very little in one day, and invariably targeting me when I walk by, largely ignoring the Burmese, for obvious reasons. 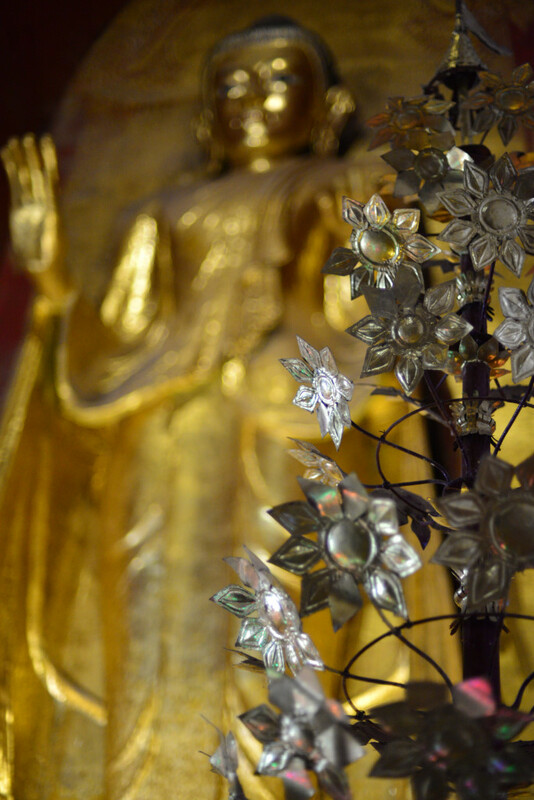 The four Buddhas facing the cardinal directions are gigantic and golden, the circumambulating public stopping to pray at certain ones, each assuming a somewhat different pose. 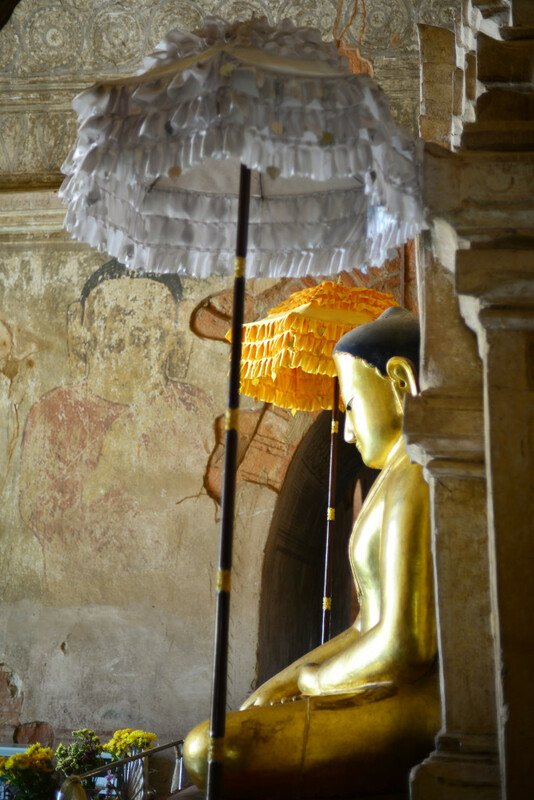 Marginal traces of old painted surfaces remain in some of the stupas. Due to the size of the temple, stellar views are offered from the superior terraces of the temple of the surrounding plains littered with elegant spires. Many of the stupas have been rebuilt, although I would hardly be qualified to comment on the integrity of the restoration efforts. Interestingly enough, almost all the tourists here are from Yangon, as it is a long weekend, tomorrow being national Farmer’s day. Few foreign package tourists are in evidence, and even less in the line of independent travelers. Another surprising observation – amidst the most popular tourist attraction in the country a bedraggled tourist such as myself can still attract some attention.